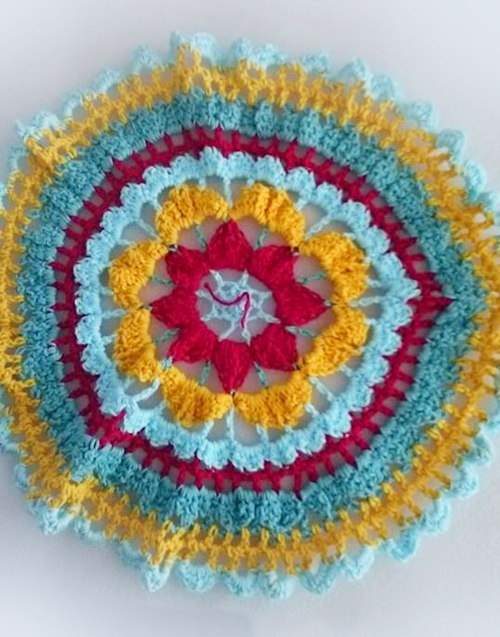 A gorgeous Full of Fans Mandala for you to use in your next project, or as a stand-alone item. Create in one color, or many, to reach the look you desire. Your Full of Fans Mandala pattern is instantly available in both standard US terms and Standard UK/AU terms, with step-by-step instructions and photos to help guide your hook to completion. The Full of Fans Mandala can be used in many different projects and there is a matching Desert Dreams Slouchy as well. In addition, the Desert Dreams Poncho, which this pattern is based on, is also available. You can use this mandala as the centerpiece of your poncho, and this pattern is included when you purchase the Poncho pattern! As a special deal, purchase both the Desert Dreams Slouchy, along with the Desert Dreams Poncho pattern (which includes this mandala pattern for free) and receive an INSTANT 20% discount on the set!